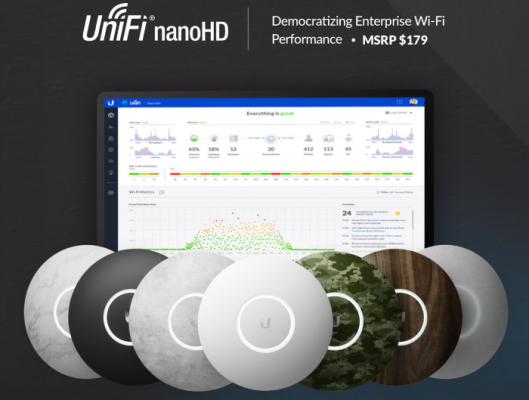 With an MSRP of $179 (1x) / $875 (5x), the new Unifi nanoHD access point is well priced. Especially considering the 802.11af power delivery, and 4×4 MU-MIMO nature of its 5GHz radio. 2.4GHz is a much more pedestrian 2×2, which is fine for most applications. Looks like these should hit retail around the end of the month. Our Smallest UniFi Access Point Available on the Market. The UniFi nanoHD AP is 30% smaller than the UniFi AC Pro AP. « Ever wondered why PBS isn’t on TV streaming services?